Hard-hitting action comes to HBO pay-per-view on Saturday, October 17th live from Madison Square Garden, with Gennady “GGG” Golovkin headlining against David Lemieux. Golovkin vs. Lemieux has been named as our World Middleweight Championship, adding even more intrigue and excitement to the explosive match. 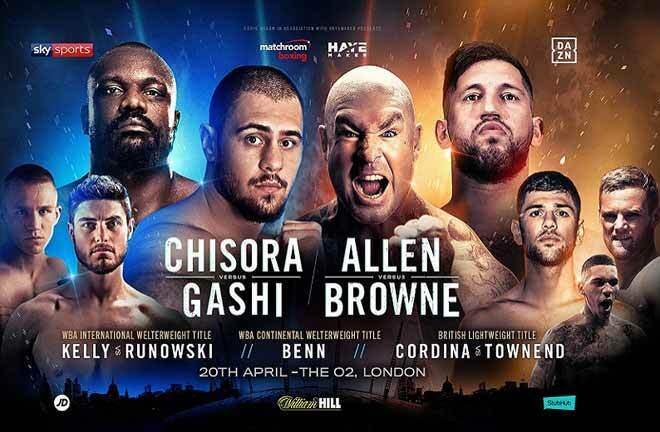 ProBoxing-Fans.com will be on hand ringside to cover the fight from the World’s Most Famous Arena, and right here is the only place you need to be all evening long for live, continuously updated coverage of the entire card, including the very enticing co-feature, Roman Gonzalez vs. Brian Viloria. Rd 1: The building is absolutely electric, great crowd. Fighters coming out slow though. Huge roars for GGG from the stands. Not much action though in the 1st minute of the fight. All jabs right now. Golovkin lands the first telling punch of the fight. Crowd overreacts though. Lemieux very hesitant to open up and go inside. Not much to differentiate the two, except that one shot. Round to GGG. Rd 2: Golovkin starts a bit more as the aggressor here. As he opens up, Lemieux is opening up with him. So this could potentially explode at any moment. They exchange missed jabs. Then Golovkin hammers him with a huge 1-2. They each just miss with a big power shot. A triple jab from Lemieux. Golovkin tries to counter with a left hook. Big right hand from GGG. Lemieux gets backed up. Stiff jab lands. Golovkin round. Rd 3: Golovkin lands a left hook but his full power wasn’t in it. Lemieux finally gets on the offensive a bit and lands a looping hook of his own. Golovkin with an uppercut to the body. Then a jab upstairs. He’s clearly trying to set up something big, as he pulled back on a right hand that wasn’t there. Lemieux biding his time, perhaps waiting for one big mistake to land something big. But in the meantime he’s not doing much effective. GGG snaps his head back with a jab. This isn’t the furious battle we were sold for this fight, but the sense in the air is that something big will happen. Rd 4: Lemieux coming forward more. He throws a 5 punch combo and misses everything, but at least he’s aggressive and has GGG backing up and not throwing. Now GGG working behind the jab. Lemieux jabs back. A 1-2 for Lemieux. More jab exchanges. Lemieux blocks a hook. Lemieux wit ha double jabthen a right but nothing lands. Golovkin hammers him with a big left, crowd going crazy. Another left follows. Lemieux a bit shaky on his legs. GGG opening up with Lemieux on the ropes. Lemieux gets back to center ring. Right hand for GGG. Big jab for GGG. He goes to teh body. Pace settles back down. GGG just misses on a huge uppercut at the bell. RD 5: Golovkin obviously doesn’t think Lemieux is too badly hurt because he’s pacing himself here. GGG lands an uppercut, but then Lemieux lands his best shots of the nights, a 3 punch combination 2 of which land flush upstairs. GGG not too fazed though and he’s still attacking. Big body shot with Lemieux on the ropes. That’s not where he wants to be. Lemieux slipping under some hooks. Lemieux goes down on a delayed reaction to a body shot. Then GGG nails him while he’s down on the canvas. But Lemieux gets up, badly hurt, and is saved by the bell. Rd 6: Golovkin isn’t pacing himself now. He’s unleashing now. Lemieux backpedaling. Trying to fire back though and show he’s not done. Jabs from Golovkin. Double jab and a right. Lemieux trying to slip and counter. Now he wraps Golovkin up. Clean left lands for Lemieux but Golovkin not bothered. GGG goes back to the body. Another clinch. Lemieux looking exhausted. Fights off the ropes though and lands a few solid shots. Golovkin picks him off with a jab. Lands a 1-2. Golovkin actually looking a bit tired too. Now he’s stalking him, hands down, just looking to unleash. And he does, Lemieux staggered but still up. Then fires back. Then gets nailed by a hook, and a sneaky uppercut at the bell. Rd 7: Lemieux looking bloodied and battered, and certainly tired. He’s hanging around but will be hard to see how he gets anything very effective done. Ref halts the action for Lemieux’s nose. Not sure why that was necessary, wasn’t getting in his eyes. Golovkin lands a hook which punctuates a combination. Lemieux throws a combination back and looks for a big left hook. 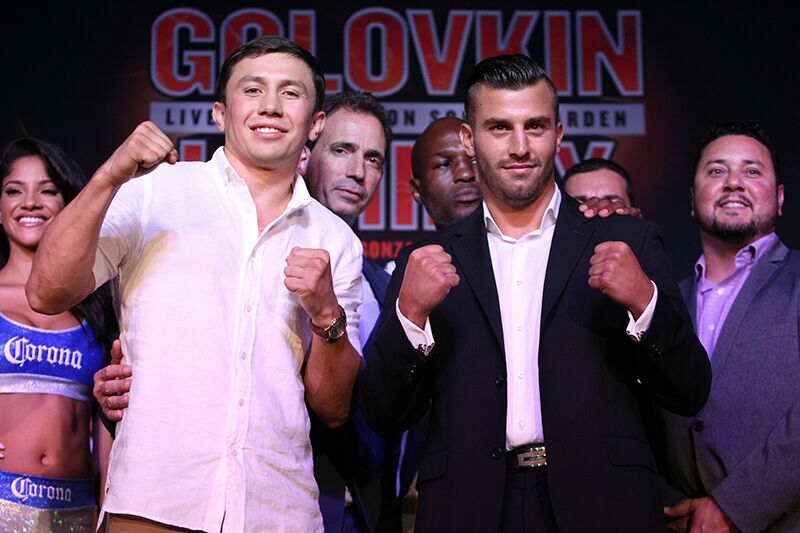 Golovkin in stalking mode again, backing Lemieux up, patiently picking his shots and waiting for the right time. Big hook and uppercut land for Golovin. Lemieux is not looking too good with that probably broken, bloody nose. Rd 8: Golovkin lands two big left hooks. Lemieux fires back with a straight right that’s probably his best punch of the night. Golovkin goes back on the offensive and with Lemieux reeling in the corner, the referee jumps in and stops it. Looks like a bad, early stoppage from this vantage. Didn’t seem like a fitting moment. Will have to see it on the TV replay, but didn’t need to stop it. Crowd isn’t happy with the stoppage that’s for sure. Lemieux says that “He has a lot of respect for Golovkin,” but that, “he’s not too sure about the stoppage.” He says he was just waiting for his time and that a lot of the rounds were close. Hard to hear more of what the fighters are saying in the post-fight interviews with Kellerman as the crowd is so loud. Good event and crowd, and strong showings from both GGG & Chocolatito. Rd 1: Both guys starting out very controlled. Viloria looks sharp and quick. Gonzalez staying with a very high guard, working behind his jab. He’s starting to open up to the body. Viloria looks for a lead right hand. They trade jabs. Interesting road to score. 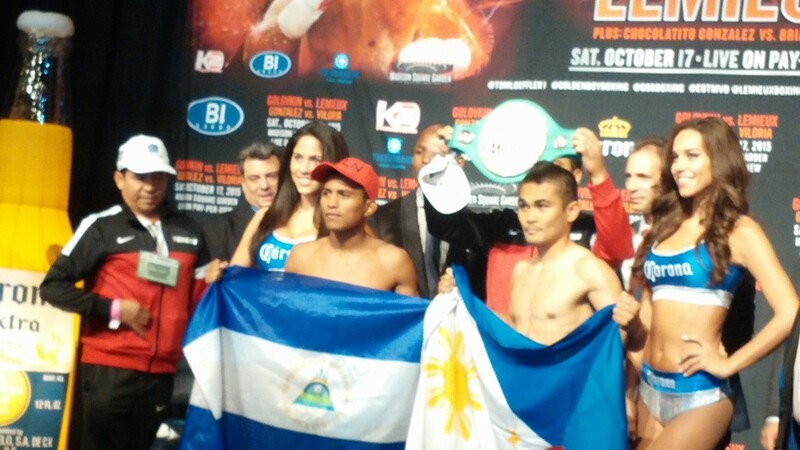 Viloria busier and more in the leading role, but Gonzalez just landed a nice combo at the bell. Round to Hawaiian Punch overall. Rd 2: You definitely notice the size difference between the two when they’re close. Viloria is doing a good jab using that to his advantage so far. Gonzalez misses with a big right hand, goes back downstairs. Now he opens up with a big series of shots. Viloria fends him off. Gonzalez investing a ton to the body. Viloria opens up with a flurry. Lands a nice left up and then downstairs, making a case for himself. But Gonzalez’s round. Rd 3: Gonzalez starting to find his rhythm early in round 3. Viloria goes down on a flush shot but hops right back up! Crowd going crazy with each punch he throws. Viloria in a bit of trouble and on the defensive. Gonzalez just winging uppercuts and hooks from all angles. All Chocolatito right now. How things have changed so quickly. Gonzalez finally slows down after a relentless tow minute assault. But then he lands another big bomb. Huge round for Gonzalez. Rd 4: Viloria seems steady to start the round and Gonzalez doesn’t jump right into it. He’s working behind his jab and setting up shots. Now he starts to open up with more power shots though and Viloria answers, landing a 1-2 and sending Gonzalez back. It’s temporary though and now Chocolatito is coming forward again, and they clinch and tangle up for a moment. Now it’s a big six punch combo for Gonzalez, and Viloria manages one clean punch in return. Viloria with a double lead left hook. Some in-fighting, good action. Round to Gonzalez. Rd 5: Gonzalez lands a nice right hand to the chin. Another. He’s finding a home for that. Viloria backs him off with some of his own offense. But Gonzalez is just relentless. More body shots for Gonzalez. Viloria leaning on him and holding on, trying to rough him up on the inside but also just trying to survive. So far this is a great demonstration of a fighter absolutely on a different level from a very good fighter himself. Rd 6: Viloria hasn’t given up. He’s just being outclassed. He’s making good efforts, just landed a good body shot, but Gonzalez just doesn’t stop throwing punches, and he unloads bombs. Punches from full angles. Quick, powerful shots, a complete arsenal. Uppercuts. Hooks. Body shots. Viloria’s taking it and hanging around but you have to wonder for how long. Rd 7: A slower start to the round here, Viloria trying to create some space. Gonzalez doesn’t allow that to last for long. Big straight right lands. Now he gets Viloria in the corner, but he scoots out of there. Another big right hand. Just five,six, seven punch combos. Viloria doesn’t have much of an answer right now. His corner or the ref should really think about stopping this one. Classic case of a guy hanging around but just getting badly beaten. Rd 8: More of the same here. 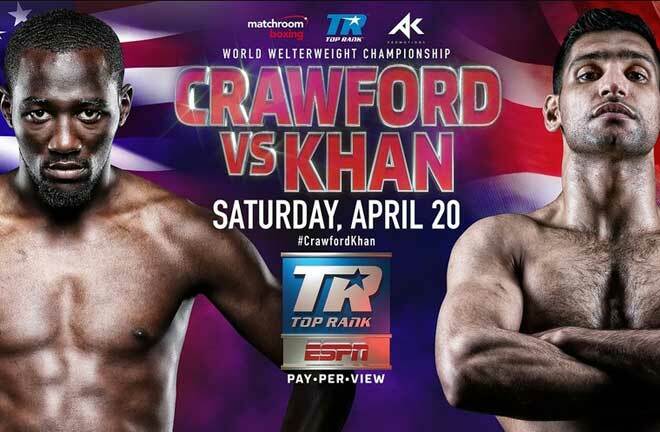 Because Viloria is just hanging around and taking the punishment, the fight continues. Gonzalez just keeps unloading. A slower pace to the punishment here but just all one-sided. Not to repeat myself here, but they should stop it. Rd 9: They took a look at Viloria in the corner but the action begins for the round. Gonzalez may be slowing down a bit, but only in comparison to the crazy pace of punishment he’s been on. Viloria really isn’t answering. Finally, the referee takes action and stops it after Viloria got rocked, with 7 seconds left in round 9. Fight starts sloppily. Maldonado finding a way to land some decent shots, but clearly the power lies with Ortiz, which is no surprise. Towards the end of Round 2, Ortiz just crumples Maldonados on a series of flush, thudding connects. 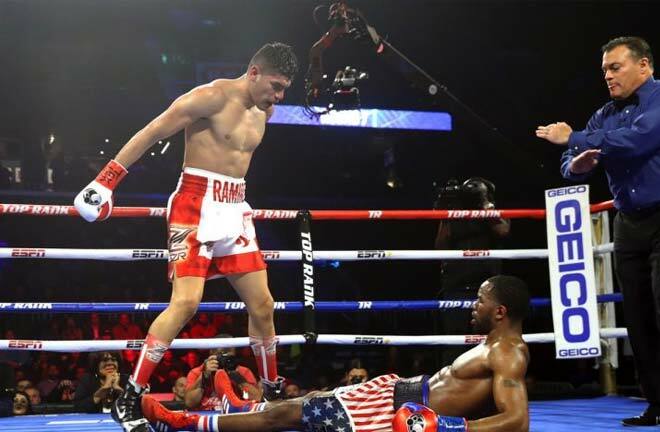 Somehow though, Maldonado found his way back to his feet and the end of the round. At the start of round 3, Ortiz sends Maldonado flying halfway across the ring with a monster shot that just could be knockout of the year. Ding ding ding, there’s no getting up from that. An overhand left just nearly decapitated him. “I deserve this win and deserve to fight the best. Vidondo did hit hard but he wasn’t good enough to face me. Everyone can see that I dominated the fight. I want to fight the best and I want Golden Boy Promotions to keep its promise and get me the best. I am ready for Klitschko, I know he is running from me. I am going to come after him. 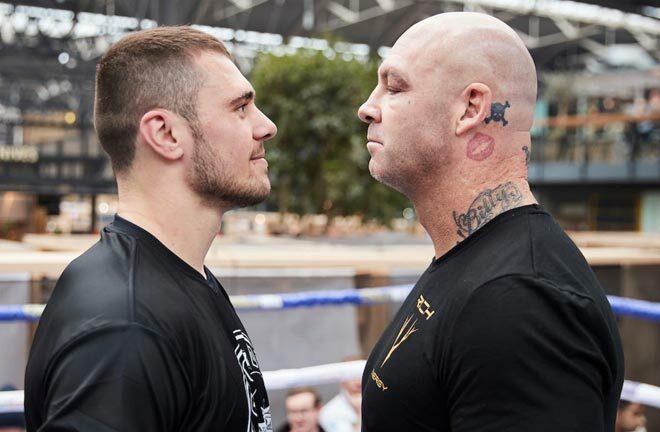 I am just ready to become the heavyweight champion of the world. Johnson floored O’Kane bout midway through round 1 and then sent him down a second time before the end of the round. O’Kane was badly hurt but managed a small rally at the end of the stanza. Johnson continued putting on some punishment at the start of Round 2. The two settled into a rhythm with Johnson’s speed and skill enabling him to get the better of the exchanges and do more damage. By the end of round 5 though, Johnson began to tire and get a bit sloppy and O’Kane did some effective work, pushing Johnson back to the ropes. In Round 6, action was mixed, with both guys having their moments. With Johnson lagging compared to the start of the bout, O’Kane continued to be able to pin him back and land to the body and head. By Round 8, O’Kane was continuing to apply pressure and come ahead. Johnson is more limited, quick pick off shots as he retreated and circled, while O’Kane was generally busier and being the aggressor. From this view, the scorecards could get funky if things continue in this fashion. The updates haven’t been rapid here because not a whole lot has happened. The action has been moderate and the two fighters have been more or less continuing along the same track. O’Kane forces the issues, throws some combinations, Johnson plays more the role of defense and slickster, moving around the ring, pot-shotting. This one should go in Johnson’s favor, but not the fight he was looking to have I’m sure, and O’Kane proved to be a tough customer after surviving the early issues. Thanks for stopping by for our live fight night coverage of the full HBO pay-per-view and all of its action. 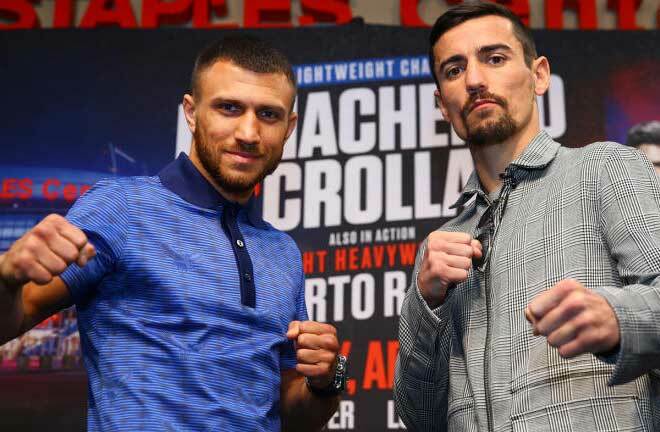 After the fights, be sure to keep on checking back with ProBoxing-Fans.com for more analysis, rankings updates and aftermath from the Gonzalez vs. Viloria and Golovkin vs. Lemieux results.